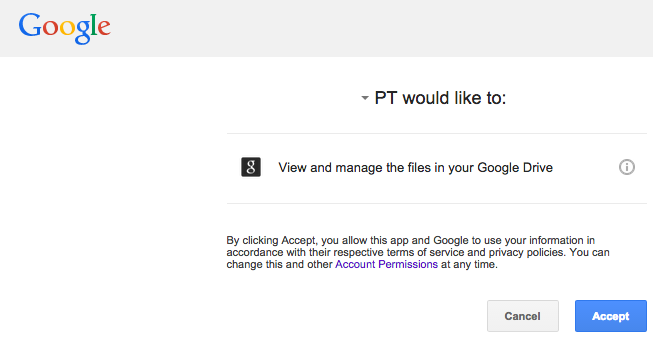 If you already have a paid Paper Tiger Online single user account and a Google Apps or Gmail account, simply connect your Paper Tiger Online account to your Google account. To learn more about Digital Tiger, go to http://thepapertiger.com/digital_tiger. Please note, Digital Tiger is not available in Paper Tiger Online multi-user accounts. 4. Click the OK button on the next popup box. 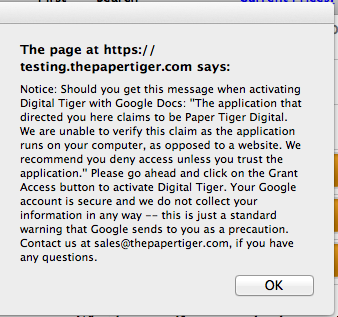 Notice: You may see this message on the Google Accounts page: "The application that directed you here claims to be "Paper Tiger Digital". We are unable to verify this claim as the application runs on your computer, as opposed to a website. We recommend you deny access unless you trust the application." 5. Click the button to Accept the connection between your Paper Tiger Online account and your Google Drive. 6. You should then receive a green flag at the top of your Paper Tiger page that Google Documents Account Linked Successfully. 7. You should then activate Digital Tiger search in the database in which you wish to search for both the physical items indexed into Paper Tiger, and for the digital files you have stored in Google Drive.